Fiction – paperback; Faber and Faber; 181 pages; 1997. Many of you may be familiar with Deirdre Madden’s most recent novel, Molly Fox’s Birthday, which was shortlisted for last year’s Orange Prize. But that was not the first of Madden’s novels to be shortlisted: One by One in the Darkness, penned 13 years ago, was shortlisted for the Orange Prize in 1997 (losing out to Anne Michael’s Fugitive Pieces). 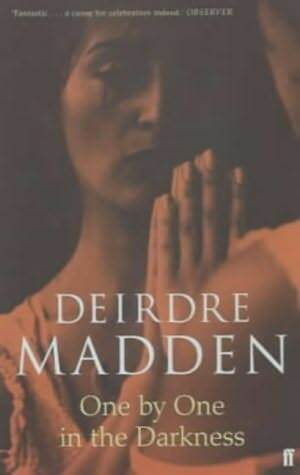 If you can forgive the horrendous cover art of my edition (see above), this is a perfect introduction to both Madden’s work (it’s her fifth novel) and how the religious and political turmoil of Northern Ireland had long-lasting impacts on normal, hard-working rural families inadvertently caught up in the conflict. The story is set in the space of one week some time in the early 1990s (the blurb suggests that it is before the start of the IRA ceasefire in 1994, but I could not find an actual date anywhere in the text). Cate Quinn, a journalist on a London-based fashion magazine, returns home to her family in County Derry to break some news she know will be upsetting to those she loves, in particular her widowed mother. This narrative is undercut with the story of Cate’s staunchly Catholic upbringing in the 1960s and 1970s, on a farm near Slieve Gallion, with her older sister, Helen, and younger sister, Sally. These flashbacks, told in alternate chapters, serve to demonstrate how their childhoods, which should have been happy and carefree, were tainted by the political violence and religious prejudices of the time. There’s a real sense of disbelief and confusion when, for instance, a civil rights march in Derry turns violent, and “now all the talk at home was about civil rights, and how things would have to change”. Equally, a trip to the Antrim coast, when they have to drive through Protestant enclaves bedecked with Union Jacks and red, white and blue bunting, puzzles them. They thought the Orange arches which spanned the roads in the towns were ugly, and creepy, too, with their strange symbols: a ladder, a set square and compass, a five-pointed star. They knew that they weren’t supposed to be able to understand what these things meant; and they knew, too, without having to be told that the motto painted on the arches: ‘Welcome here, Brethren!’ didn’t include the Quinn family. But this is early days, and later, when soldiers begin turning up on their doorstep, interrogating them and lifting their uncles who live on a neighbouring property, it’s clear that the world outside their “few fields and houses” has encroached on their day-to-day existence. This novel is largely a study of relationships: there are family tensions at work on almost every page, and Madden expertly captures the unspoken anxieties between people without spelling everything out. Indeed, the circumstances revolving around the death of Cate’s father are never fully explained until the closing chapters of the book, and it is only when you realise what has happened, and how it has happened, that the tremendous force of Madden’s storytelling abilities come into play. But One by One in the Darkness is also an astute look at the “idea of home” and how each character chooses to identify with Northern Ireland. Madden very cleverly uses the dual narrative to show how the sister’s current lives have been shaped by events of the past: Cate, has reinvented herself in London and changed the spelling of her name from Kate to Cate in order to sound “less Irish”; Helen, now a criminal lawyer based in Belfast, has rejected religion and is trying to atone for “past wrongs that could never be righted”; Sally, a teacher, has never left the local area, although she feels trapped and dreams of escape. I remember being on holiday in Italy once, and loving it there until I saw this two-day-old English newspaper in a kiosk, with a report on the front page about a car bomb having exploded in Belfast. All at once, I wanted to be there. I felt guilty for not being at home, not that it would have made the slightest bit of difference. I mean, apart from the odd holiday I’ve been here right through the Troubles, and it hasn’t made a blind bit of difference to anything. There hasn’t been so much as a shot less fired because of me, but it would have made a difference if I hadn’t been here, it would have made a difference to me. I can’t explain it any better than that. If there’s any fault to be had with this novel, it is that the writing sometimes feels forced and the dialogue unnatural. And Cate’s news, which is disguised as a terrible secret (but is easily guessed), is revealed too soon, halting the momentum of that particular narrative thread. But on the whole this is a superb look at Northern Ireland’s troubled history from a female perspective. I’ve been wanting to read Deirdre Madden and have Molly Fox’s Birthday on hand. This sounds good as well, but when I went to look for the books on your list at my library I only came up with The Ghosts of Belfast, which I just brought home from the library today and hope to read along with you. I’m looking forward to hearing about the rest of the books on your list. What a pity the books aren’t readily available across the pond. I know that Jennifer Johnston titles can be hard to get hold of in the US — god knows why, she’s such a terrific author. Pleased you got hold of The Ghosts of Belfast/The Twelve. I’ll be tackling that shortly, as I’ve now read the previous two novels. I have to admit my expectations aren’t high, as I’ve heard some mixed things about it. But I’ll reserve judgment until I’ve given it a try myself. Oh, and do read Molly Fox’s Birthday. I loved it. Normally I wouldn’t mind–just place a nice quick order with The Book Depository, but as I am determined to not use my credit card for a while (am trying to pay off the balance by the end of the year) that means no book ordering. Anymore most British books are published here though there is a lag time, but it’s too bad they aren’t more readily available now. The Neville might turn out to be a good thriller, which is what I seem to be reaching for a lot lately–books like hat are always nice when life is stressful.